Jammu & Kashmir Current Events - Governor pays obeisance at Shiv Khori, takes stock of facilities for visiting pilgrims on Maha Shivratri. Jammu, February 23 – Governor, Mr. N. N. Vohra, today visited the Holy Shrine of Shiv Khori in Reasi district and paid obeisance at the sanctum sanctorum on the occasion of Mahashivratri. New Delhi, February 23 – Jammu and Kashmir Festival took off to a colourful start here this evening with President, Indira Gandhi National Centre for Arts (IGNCA), Mr. C. R. Garekhan lighting a traditional lamp to inaugurate the festival. 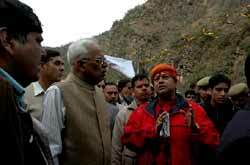 The Governor walked the six kilometers from Ransoo to Shiv Khori and back. Mr. Vohra had darshan of the sanctum sanctorum and performed pooja. He prayed for communal harmony and peace and prosperity in the State. The Governor interacted with a large number of pilgrims, who had thronged the Shrine in view of the Mahashivratri and enquired from them about the facilities available, particularly those relating to drinking water, electricity, shelters etc. He also inspected the on-going development works being executed to provide upgraded amenities to the visiting pilgrims at Ransoo, the base camp of the pilgrimage, enroute and in the Holy Cave Shrine area. The Governor emphasized that while planning for facilities environmental concerns must remain at the top of the Board’s agenda. He stressed the need for evolving a comprehensive strategy for waste management, particularly the aspects pertaining to technology, human capacity and partnerships with the local people. He announced a grant of Rs. 2 lakh from the Shri Mata Vaishno Devi Shrine Board for post-Shivratri sanitation management by the Board, jointly with the Langerwallas. The Governor emphasized the need for putting in place all the basic facilities expeditiously by completing the on-going development projects, right from Ransoo to the Holy Cave Shrine, within a fixed timeline, as lakhs of pilgrims visit the Shrine every year. The Deputy Commissioner, Reasi, Mr. Sanjeev Verma, who is also the Vice Chairman, Shiv Khori Shrine Board, presented to the Governor a detailed profile of various development works under-execution in the Shrine area. He informed that the Government has formulated a comprehensive Master Plan for development of Shiv Khori as a revered pilgrim tourist destination and an amount of Rs. 12.50 crore has been approved for the purpose. A five-storey waiting hall is also being constructed as part of the Master Plan, adding that, on completion, it would accommodate about 7,000 Yatris. The Principal Secretary to Governor, Mr. B. B. Vyas was also present on the occasion. The eight-day event has been organized by Jammu and Kashmir Academy of Art, Culture and Languages, in collaboration with ICNCA. Eminent Dogri writer, Mrs. Padma Sachdev and santoor maestro, Pandit Bhajan Sopori, a galaxy of artistes from all the three regions of the State, prominent citizens and art and culture lovers were present on the occasion. Mr. Garekhan, in his address, complimented the Cultural Academy in its endeavour of promoting national integration through dialogue and cultural interaction. He said the cultural exhibition which is part of the exhibition is greatly inspiring, adding the visitors of the festival would be curious to visit the State for gaining in-depth knowledge about its diverse art and culture. Stating that Jammu and Kashmir is a confluence of distinct cultures that gives it a unique place in the country, Mr. Garekhan said that more such events should be organized across the country. Mr. Zafar Iqbal, Secretary, Cultural Academy said the Academy has developed into a prime cultural institution, adding that the objective for organizing this event in the union capital was to showcase the composite legacy of art, culture, languages, theatre and cinema of Jammu and Kashmir. Rare paintings of indigenous architecture of Kashmir and Jammu, digital photographs of Ladakhi monasteries, old manuscripts, photo documentation of manuscript heritage depicting composite culture of Kashmir, Jammu and Ladakh will be the main attractions at the festival. Besides, documentaries, feature films and typical folk dance and music of all the three regions of the State will be another highlight of the cultural event. Also on display will be books published by Cultural Academy highlighting the rich ethos, literature and philosophy of Kashmir, Jammu and Ladakh.